World Record: 5 lbs. 15 oz. Where to find them and their Life cycle. This one likes the cold water, folks. Frigid water, actually, is where the Grayling thrives. In the continental USA, the only place to find them is where the upper Missouri river drains in Montana. Aside from that spot, the icy waters of drainages from the Pacific and Arctic Oceans in Canada, Alaska and Siberia (BRRRRR) is where the A.G. is prevalent. Not a large fish, the Grayling has a recorded max length of 30 inches and a weight of just over 8 pounds. I would say that an average fish would be in the 3 to 4 pound range at approximately 12 to 15 inches. 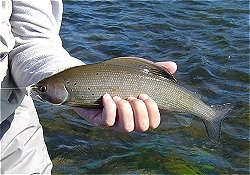 Arctic Grayling are known to live for as long as 18 years. In the spring, males begin courting females in shallow streams by strutting their manly colored fins. The fertilization is done simultaneously and the eggs are deposited in the fine sandy bottom of the shallow stream and are left unguarded. They hatch two to three weeks later and the young remain in the sand until the yolk sac is totally absorbed; about 2 weeks. The young Grayling are less than an inch long at this point and grow exponentially for the first two years. Like any of the Salmonidae family of fishes, the diet of the Grayling is almost identical to that of other salmon or trout. Caddis flies, mayflies, insects, and anything that floats by on the current. Terrestrials like ants, grasshoppers, and such that have the misfortune of falling in the water will become a meal for the Grayling. Since the Arctic Grayling will return to the frigid waters mentioned before, they eat constantly and store the fat for the winter, when they will be "under the ice" for eight, long, lean months. The Grayling will consume HUGE amounts of food during these times, so should be easy fly fishing targets. Again, like their trouty and salmony cousins, they are opportunity eaters. If it makes itself available, they are ready to chomp on 'em! Cooking and enjoying Grayling is as simple as Simon was. All of the preparations for trout and salmon will work with Grayling. Everything from sautéing in a skillet with butter and a little Grand Marnier to smoking the fillets and eating them on crackers or cocktail breads is allowable. Try something different (we won't tell) and let us know about it. Arctic Grayling look like a hybrid salmon/trout cross breed. The exception is that large fin in the center of the back of the Grayling. This is the manly colored one that males use to impress females with during "happy hour" every spring. 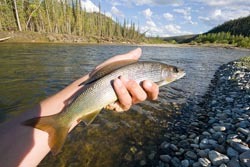 The Arctic Grayling also has a distinct pink hue to the skin that is absolutely discernible from other fishes. In no way would you EVER think this was a rainbow trout unless you were either inebriated or seeing one for the first time.